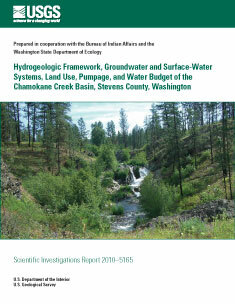 A study of the water resources of the unconsolidated groundwater system of the Chamokane Creek basin was conducted to determine the hydrogeologic framework, interactions of shallow and deep parts of the groundwater system with each other and the surface-water system, changes in land use and land cover, and water-use estimates. Chamokane Creek basin is a 179 mi2 area that borders and partially overlaps the Spokane Indian Reservation in southern Stevens County in northeastern Washington State. Aquifers within the Chamokane Creek basin are part of a sequence of glaciofluvial and glaciolacustrine sediment that may reach total thicknesses of about 600 ft. In 1979, most of the water rights in the Chamokane Creek basin were adjudicated by the United States District Court requiring regulation in favor of the Spokane Tribe of Indians’ senior water right. The Spokane Tribe, the State of Washington, and the United States are concerned about the effects of additional groundwater development within the basin on Chamokane Creek. Information provided by this study will be used to evaluate the effects of potential increases in groundwater withdrawals on groundwater and surface-water resources within the basin. The hydrogeologic framework consists of six hydrogeologic units: The Upper outwash aquifer, the Landslide Unit, the Valley Confining Unit, the Lower Aquifer, the Basalt Unit, and the Bedrock Unit. The Upper outwash aquifer occurs along the valley floors of the study area and consists of sand, gravel, cobbles, boulders, with minor silt and (or) clay interbeds in places. The Lower aquifer is a confined aquifer consisting of sand and gravel that occurs at depth below the Valley confining unit. Median horizontal hydraulic conductivity values for the Upper outwash aquifer, Valley confining unit, Lower aquifer, and Basalt unit were estimated to be 540, 10, 19, and 3.7 ft/d, respectively. Many low-flow stream discharge measurements at sites on Chamokane Creek and its tributaries were at or near zero flow. The most notable exception is where Chamokane Creek is supported by discharge of large springs from the Upper outwash aquifer in the southern part of the basin. Most high-flow measurements indicated gains in streamflow (groundwater discharging to the stream). Large streamflow losses, however, were recorded near the north end of Walkers Prairie where streamflow directly recharges the Upper outwash aquifer. The similarity in seasonal water-level fluctuations in the Upper outwash aquifer and the Lower aquifer indicate that these systems may be fairly well connected. Land use and land cover change analysis indicates that Chamokane Creek basin has been dominated by forests with some pasture and agricultural lands with sparse residential development from the 1980s to present. Loss in forest cover represents the largest change in land cover in the basin between 1987 and 2009. This appears to be mostly due to forestry activities, especially in the northern part of the basin. Since 1987, more than 18,000 acres of evergreen forest have been logged and are at various stages of regrowth. Estimated average annual total groundwater pumpage in the basin increased from 224 million gallons per year (Mgal/yr) in 1980 to 1,330 Mgal/yr in 2007. The largest withdrawals during 2007 were to supply two fish hatcheries, with a combined total annual pumpage of about 1,150 Mgal. Annual groundwater pumpage values from 1980 through 2007 for the study area ranged from 21.1 to 28.9 Mgal/yr for domestic wells and 0.38 to 23.7 Mgal/yr for public supply. An approximate water budget for a typical year in the Chamokane Creek basin indicates that 19.6 in. of precipitation are balanced by 4.7 in. of streamflow discharge from the basin, and 14.9 in. of evapotranspiration. Kahle, S.C., Taylor, W.A., Lin, Sonja, Sumioka, S.S., and Olsen, T.D., 2010, Hydrogeologic framework, groundwater and surface-water systems, land use, pumpage, and water budget of the Chamokane Creek basin, Stevens County, Washington: U.S. Geological Survey Scientific Investigations Report 2010-5165, 60 p.